Editor's note: This should more properly be called a book reportlet, but as our spellcheck would have murdered us had we gone with that title, we had to use the less-than-accurate report. We pretend nothing more than a cursory familiarity with the book in question. And now, on with the… thing. 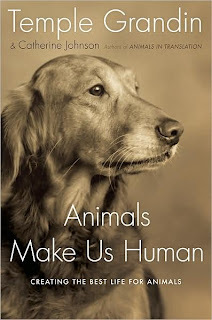 We can summarize Temple Grandin's Animals Make Us Human (Houghton Mifflin Harcourt, ISBN: 978-0151014897) in five words. Treat 'em better, then POW! We concede that while this is a finer sentiment than "Give 'em hell, then POW!" it's not the most transcendent philosophy we've ever heard. Noted livestock advocate Grandin has devoted her career to understanding the mysteries of animals' inner lives and speaking for them in their muteness. She tells us that pigs have "lively, active minds," that cows form "close relationships, especially between sisters and between mothers and daughters," and that chickens are "intensely attached to their mamas." And where has her insight led her? Not to urgent pleas to spare the animals, possessed as they are of their own drives, desires, joys, and terrors. Nor to seeking legal protections for the most vulnerable among us. No, no. Not there, but instead toward more thoughtfully designed slaughterhouses. In other words, toward making a grotesque industry merely sickening. All that empathy, employed in the service of killing them with kindness—literally—on behalf of some of corporatedom's heaviest hitters! wow. what a soft hearted lady she must be. perhaps she could submit to have her nails pulled out so that it makes her an even deeper, finer person. like emma thompson's said - i like humans who have suffered better. they're kinder people. I've actually read this book and I agree with your summary. I can't understand all the rave reviews it's getting--including some from people in the animal rights community! they got a peta award for compassion after all... when i saw the photo of the cover i thought it was a photoshop joke to their compassion claims, but no they actually state they are creating "the best life for animals"! There's more than one way to look at it. On one hand, Temple Grandin is an obvious hypocrite -- if she wants to reduce the suffering, how can she work to design the tools of mass slaughter? If she knows so much about animals, shouldn't she be telling everyone to stop eating them, not helping out? On the other hand, her work has made so much more real and measurable progress in animal welfare than any single activist I can think of. She's convincing meat "farmers" that animal welfare deserves consideration, and can actually save them money -- it's not just an expense forced upon them by government to be fought in any way possible. This is a required step. Another thing to notice -- there are plenty of people who know just as much about animal intelligence as Temple Grandin, if not more. Some of them are probably even autistic. Does anyone listen when they talk? "Local austistic woman talks about animal feelings, tonight in the elementary school gym"! You'll get a handful of people who are ALREADY vegetarians and, uh, how many meat industry execs? The world needs idealists -- they inspire us, encourage us to imagine a better world and work towards it. But we'd be fucked without the pragmatists who actually draw the line between point A and point B and say "you gotta go through here." I'm looking forward to her next book, "Dark-skinned People Make Us Whiter." I think it's safe to say that every single person who has gone vegan has done more for animal welfare than Grandin, who just makes people feel better about consuming their special-wecial "cruelty-free" animal products. If Temple Grandin really understood the minds of other animals, she'd stop designing slaughterhouses and start working for their freedom from slavery and murder. Animal Rights vs Animal Abuse"
I don't get it... She "thinks in pictures" --- But only pictures of efficient cattle ramps, chutes and sanitized knock out boxes. Me? The pictures I see when I think "slaughterhouse"... I can't bear to invision. I guess she's a lucky one... Those impages are out of her view completely. I saw the HBO movie tonight, which led me to this site. The beef industry is behind her on all their sites. That tells me all I need to know. She even states that she presented the meat industry in a favourable light. Anyone who claims McDonalds has led the crusade into treating farm animals better has a screw loose or is getting paid big bucks. I can criticize Grandin all I want without being afraid I'll be labelled anti-autistic, no matter what the meat industry thinks. Making a better mousetrap doesn't mean you understand, care for, empathise with, or love mice... it just means you've invented a mousetrap that kills mice quicker, more efficiently, and cheaper for the manufacturer and consumer of mousetraps. It doesn't make you compassionate, even if you have Autism or any other ailment. And GloryBug... You are right in everything you say. More welfare garbage which solves nothing. "Treat 'em better, then POW!" -- Perfect. I love SuicideFood. Sesame Street's "I Am Chicken!"